Re-Launch of Ireland's largest fancy dress costume shop provides consumers with outfits for any size or occasion. Cavan, Co.,, Ireland - - January 11, 2014 /MarketersMedia/ — A recent report by the National Retail Federation revealed that consumers spend more than $26 million on Halloween costumes each year. During the same period, a Forrester Report indicated that online shopping is expected to exceed $327 billion by 2016. With these facts in mind, Ireland's Costume Corner has announced the re-launch of their Internet shop. The business provides a wide range of men's, women's, and children's costumes, in a wide variety of styles and sizes. Company representative Francie McNally stated, "We are proud to be Ireland's leading fancy dress store, supplying all types of costumes throughout the country. We have over 1000 products in stock, and invite customers to take a look around our site. We are sure they will have no trouble finding a suitable outfit for any fancy dress party. Our huge selection offers great ideas and a large variety of options. We specialise in Hen and Stag themed apparel. If there is something that customers want, but don't see on our website, we invite them to call us, and we will get it for them. The store's inventory includes costumes for men, women, and children. Our shop offers a large selection of Halloween costumes, in a large variety of sizes, and we provide 24-hour delivery to all of Ireland." Costume Corner's women's outfits include pirates, burlesque, medical, Greek and Roman, rock stars, and even a Catwoman costume. Shoppers can save money by selecting from the site's budget choices, or even find the ideal outfit in the second-hand section. Men are also offered a variety of costumes that include period clothing, such as 1950's through 1980's styles. They may also select from sports, military, fairy tale, and seasonal choices, among many others. Children's options include animals, ballerinas, mega-stars, and even flower costumes. Buyers will also find the perfect accessories for their outfits. Choices include wigs, boots and shoes, beards, masks, stockings, and hats. "We aim to make every customer's dressing up experience a fun one. We stock a great selection of animal and character mascot costumes that are especially great for parades and kids' birthday parties. The shop offers a selection of period costumes, from Medieval to Georgian and Victorian. Shoppers can also hire costumes on our site, by following a link that provides a gallery of choices. When a client wants a fabulous and great quality costume for any costume event, we can help. We ship Nationwide as well as worldwide, so, with just a few clicks, customers can have any costume delivered straight to their doorsteps. ", explained McNally. 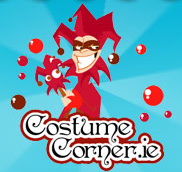 Costume Corner is an Irish-owned family business located in Co. Cavan, Ireland. Established in 1989, the company is an extension of The Dublin Costume Co. The business specializes in providing quality, affordable dress costumes to customers worldwide. Their inventory ranges from children's apparel to adult, seasonal, and special occasion outfits. Costume Corner is committed to providing outstanding quality and service, and will deliver merchandise door-to-door, worldwide.